I guess this is the beginning of week three since Hurricane Harvey flooded our home. It has all gone by in a fog. Thankfully, our adjuster came and we can now begin closing up the walls and getting things back in order. I’m having two new cabinets built for my studio because my other ones were made of “manufactured wood” and didn’t withstand the water. It’s really hard to get back in the groove, but I’m gradually getting there. We have everything in the studio that we need to get t-shirt quilts and quilting jobs done, but I’m missing my wall decor and will be glad when I’m not looking at bare sheetrock. And to add insult to injury, or injury to insult in this case, I broke my toe the day it flooded. I walked around with it about ten days and decided I’d better see the podiatrist when my foot kept swelling and hurting. So now I have my toe wrapped snugly with its neighbor and I’m wearing a special shoe for a few weeks. Oh well, there are worse things and Irma is pounding her fury on Florida as I write this, so I shall be grateful. I did have a fun thing happen this week. 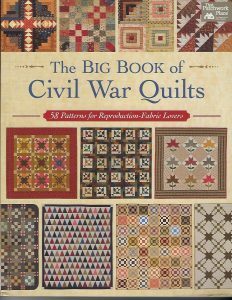 As I’ve previously mentioned, I do some quilting for Red Crinoline Quilts and one of their quilts that I had quilted was featured in The Big Book of Civil War Quilts that was recently published by That Patchwork Place. So I ordered the book and it came in just the other day when I was feeling a little bit blue. It’s always nice to see one’s name in print and I was glad to see that credit was given to me as the quilter. 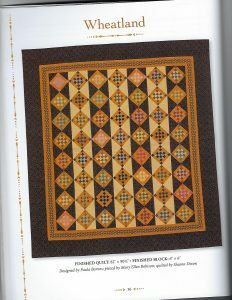 The book has some really nice quilting patterns in it, so it’s definitely worth buying. Now, back to trying to get my groove back. We are taking appointments now, so give us a call and we’ll get started on your t-shirt quilt or your machine quilting job.